The combination of our exacting manufacturing standards, cutting-edge Micro Piezo® and PrecisionCore® technology, Epson DURABrite Ultra and ULTRAChromeDL inks and decades of leadership in printing technology, are the guarantee for the seamless quality of our inkjet printing solutions. Prints are much more hardwearing with our pigment ink, which sits on the surface of the media and is highly resistant to light, water, humidity and the ozone thanks to the ink's resin encapsulation. The UltraChromeDL pigment ink particles infiltrate to the gloss media more than DURABite Ultra ink particles. Due to the even reflection from the printed side, the results give a more glossy appearance. Epson Micro Piezo® inkjet printers deliver the ink using electrical charges instead of heating which enables precise control over droplet size and placement. With droplets as small as 3 picolitres, quality and clarity is significantly enhanced. This system also keeps costs down because the printhead lasts the lifetime of the printer. 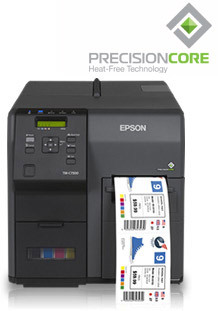 Epson's AID technology uses a sensor near the printhead that counts the electrical charge from each ink drop to determine if a print nozzle is clogged. If a problem is identified, the printer will automatically start a cleaning cycle and in a few seconds the printer is ready to print again, ensuring maximum accuracy on crucial elements on the printed labels such as barcodes and colour codes. PrecisionCore introduces a new system that uses the power of the piezo crystal itself to raise reliability. 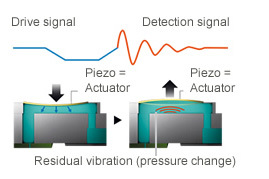 The voltage generated by each piezo element can, in milliseconds, be used to detect whether the associated nozzle is firing normally. It has the ability to self-diagnose its health almost instantly.